Remember Thurlis Hassel? Career Criminal on probation arrested for Drug Charges with a GUN and FREE TO GO only to violently beat his girlfriend within days of his Release! NJ Bail Reform – BREAKING from Clifton ! EX-CON…LOADED GUN…FREE TO GO ! Appointed to the Superior Court February 2010, Judge McBride has had it pretty tough lately. NJ Bail Reform has put him smack dab in the middle of the unaccountable and taxpayer funded release of offenders…day after day. We feel bad for Judge McBride…after all, it’s Judge Rabner and Judge Grants marching orders behind the scenes doing the damage. But, you know what they say…guilty by association. 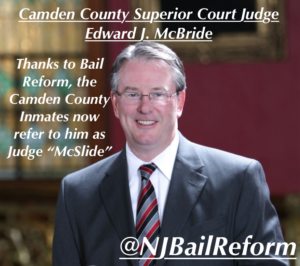 Thanks to Bail Reform, Judge McBride is commonly known as Judge “McSlide” to the inmates in Camden County. Judge McBride has court every Friday in Camden…join in on the fun anytime, FREE of CHARGE. NJ Bail Reform – BREAKING from Mahwah ! On January 30, 2017, Senate President Steven Sweeney and Senator Robert Singer introduced Bill No 2933 which establishes a one-year property tax levy Exclusion for bail reform costs. As if the continued unaccountable release of violent offenders wasn’t enough…now he wants to pay the 500 Million dollar tab with a property tax increase! NJ Bail Reform – BREAKING EXCLUSIVE NEWS! William S Schreiner was arrested in Gastonia, NC and later booked in Gaston County Jail on December 30, 2016. Schreiner was later extradited to New Jersey on January 16, 2017. Schreiner, who had fled from Gloucester County was RELEASED today…FREE TO GO – RELEASED by Court Order. Welcome to NJ Bail Reform…exposing why Bail Reform is LESS SAFE at the Taxpayers Expense! Contact your legislators today with 2 Simple Clicks and tell them to STOP Bail Reform and the unaccountable and reckless release of offenders!